Habitat: Riparian. This wildflower can be found growing in sunny locations in moist soil along streams, seeps, and rivers in the deserts and uplands. Because of its showy flowers, it is also cultivated as an ornamental garden plant. Flower Color: Golden yellow. The cultivated forms can also have solid white or bicolored yellow and white rays. 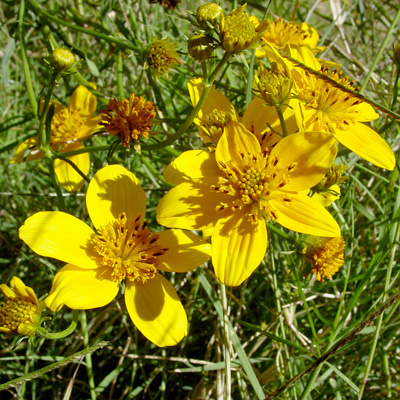 Description: The flower heads are up to 3 inches (7.6 cm) wide and have 5 or 6 elliptical, golden yellow, lengthwise-pleated rays and yellow, tubular disk flowers with brown staminal tubes. The leaves have either entire (untoothed) or serrate margins and are green, petiolate, hairless or minutely hairy, opposite on the lower part of the plant, and variably lance-shaped, 1-pinnately lobed with 3 to 5 (or more) narrowly lance-shaped lobes, or 2-pinnatisect and fernlike with deep, narrow lobes. 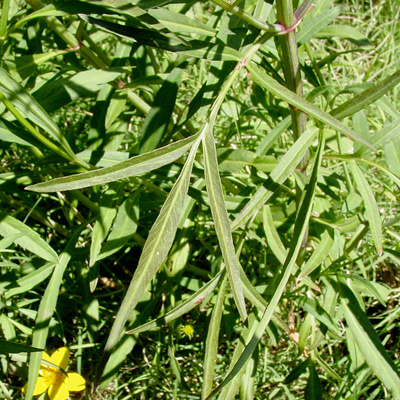 The stems are long, slender, green, and branched. 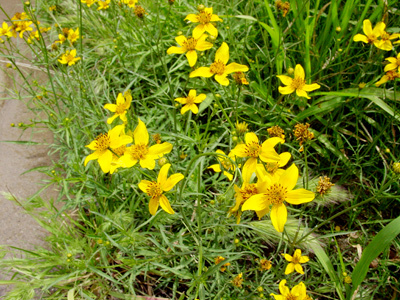 The other Bidens species found here have smaller, much less showy flowers.